Baccarat is one of the most popular casino games of chance that don’t require any special skills or betting strategies to be able to play them and win cash. If lady luck smiles at you, you can walk away with pretty good payout. The game can be played at land based, online and mobile casinos. If you want to play the game whenever you want to, regardless where you are, play mobile baccarat. However, first you need to find a mobile baccarat casino compatible with your mobile device. In addition, make sure the casino is legally licensed, safe and offers fair games. Mobile baccarat is quite easy and simple to play. Most casinos allow you to play the game in both play-for-fun mode and real money mode. To win real cash, make a deposit and place real money bet. 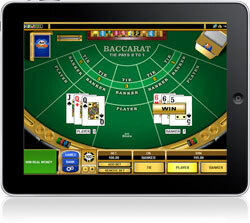 Before playing mobile baccarat, you need to get access to a mobile casino compatible with the mobile device you own. If the casino is made in HTML5, type in the casino URL in your browser and sign up. If it is app-based, download and install the app on your mobile device. To play real money mobile baccarat on the go, fund your mobile casino account and select the game in the lobby. Then place a bet on either the Player’s hand or the Banker’s hand. You can also place a bet on Tie. Two cards are then dealt to both the Player and the Banker. If necessary, a third card is dealt. Whoever gets a higher hand wins. The hands on mobile baccarat are ranked according to the right-most digit of their total value. For example, if a hand is comprised of a 6 and 7, the total sum is 13, but the hand is valued as a 3 due to the right-most digit. The optimal strategy for the game is to place a bet on the Banker because it has a slightly lower house edge than that of the Player. The biggest difference between mobile and online baccarat for real money is that you can take the mobile version with you anywhere you go and play the game whenever you wish. The mobile convenience is the biggest benefit of playing baccarat on the go. However, mobile baccarat may lack in graphics quality compared to that of online baccarat. After all, you are playing on a smart phone or tablet and mobile devices have smaller viewing area than that of desktop PCs. The game may also load slowly. There are many safe and secure online casinos that offer mobile baccarat apps so you can play the game on the move. The multi-software powered 888 Casino is an excellent casino with great reputation that has mobile responsive deign. To play mobile baccarat, visit the casino directly on your mobile browser, sign up and make a deposit. Bet365 Mobile Casino is compatible with iPhone, iPad and Android. Part of the Fortune Lounge Group, RoyalVegas Casino is another safe and trustworthy online casino that is also mobile compatible. Visit the casino on your mobile browser and pick mobile baccarat in the lobby. The casino is compatible with iOS, Android, Blackberry OS and other smart phone mobile operating systems. EuroGrand Casino is a Playtech-powered online and mobile casino licensed in Gibraltar. To get access to mobile baccarat, scan the QR code with your mobile device or enter your phone number to get the link via SMS. EuroGrand Mobile is compatible with iPhone, iPad and Android.